Posted January 19, 2018 by The Rapid & filed under News. Calling all car commuters! Gas prices are on the rise. In a recent gas price forecast from GasBuddy.com, it’s predicted that U.S. households will spend more on gas than they did previously in 2017. GasBuddy expects prices at the pump nationwide to average out to about $2.57 per gallon of regular gas and $2.70 per gallon of diesel throughout the year. Analysts anticipate regular gas prices to peak in May, with most gas stations charging $2.57 to $2.88 per gallon. Do you know exactly how much your commute is costing you? Use the handy West Michigan Rideshare Commute Cost Calculator to calculate just how much your miles, gas, maintenance and other aspects of your drive are really ringing up to. If you’re hoping to stick to your budget this year, cutting down on how often you’re filling up your gas tank can be one way to stay in check. One of the best ways to combat car costs is by using alternative modes of transportation whenever possible. Did you know that Americans spend more than 100 hours a year commuting to work? It is no secret that car commutes can not only be hard on your wallet but also straining on your mental and physical health. If your ability allows you, one way to ensure you’re utilizing your car less is by walking and biking to as many destinations as possible. While many of you may not live within a reasonable walking distance from your workplace, there’s a chance that many places you visit really are walkable. Consider choosing a destination and using the walking feature on Google Maps to see how long it would take you to walk there. If you have a bike, dust it off and make a point to ride it more this year. You may not be brave enough to make use of it in the winter—a big salute winter bike commuters—but it doesn’t hurt to start planning for warmer weather. Grand Rapids metro area has made a significant investment in infrastructure such as bicycle lanes so you can ride even more safely to get where you need to go! Many of your favorite places likely have bike parking, too. Consider walking or rolling to the library, your favorite restaurant, coffee shop or local shop. Don’t forget your helmet! According to the January 2018 Transit Savings Report by the American Public Transportation Association, taking public transportation and living with one less car can save an average of $825 per month. Using The Rapid as your main mode of transportation may not be possible for everyone but even if you’re riding a few times a week, you’re still going to be saving money in the long run. 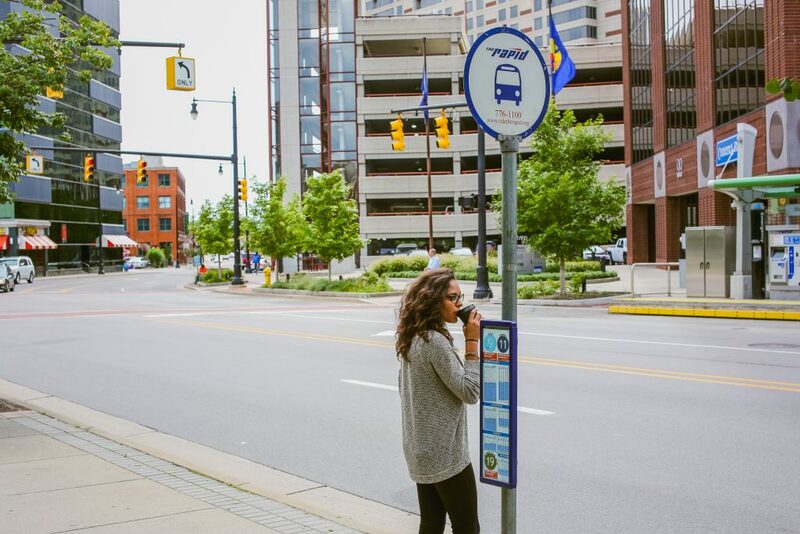 Using transit is also a way to incorporate more walking into your travel and get a little bit more personal time to enjoy a podcast or book instead of keeping your eyes on the road. Use The Rapid’s Trip Planner tool (powered by Google Maps) to see what destinations you can ride the bus to and what bus stops are located near your home, workplace and other destinations you regularly visit. If walking, biking or busing just aren’t possible for getting to your place of employment, West Michigan Rideshare may be perfect for you. Commuting alone can be a drag. This program through The Rapid offers Kent, Ottawa and Allegan counties solutions for connecting riders trying to find a better way to manage their commutes as well as the business community seeking solutions to improve travel for employees. Whether this means joining a vanpool with people who have similar commuting patterns as you or finding someone to carpool with via the Online Rideshare Matching database, our ridesharing service could help you save money on gas and do the environment a favor in the process! Commute smarter and savvier in 2018 with these tips!